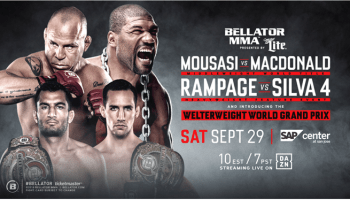 After over two months, Bellator MMA was back with an event yesterday in Thackerville, Oklahoma that featured the semi-final bouts of their two Summer Series tournaments consisting of four fighters each. One fighter making his return to the cage was “King Mo” Muhammad Lawal, coming back from a devastating knockout loss to Emmanuel Newton earlier this year. Well, King Mo fought Seth Petruzelli, and he probably couldn’t have done a better job of putting that loss to Newton in the past, with a huge, booming knockout in the first round. Check out the video of the fight from last night.